Itema040111c - Totem pole, Stanley Park, Vancouver, B.C. Source of title proper: Title from inscription. MOA Object ID numbers correspond to poles in the image from left to right. 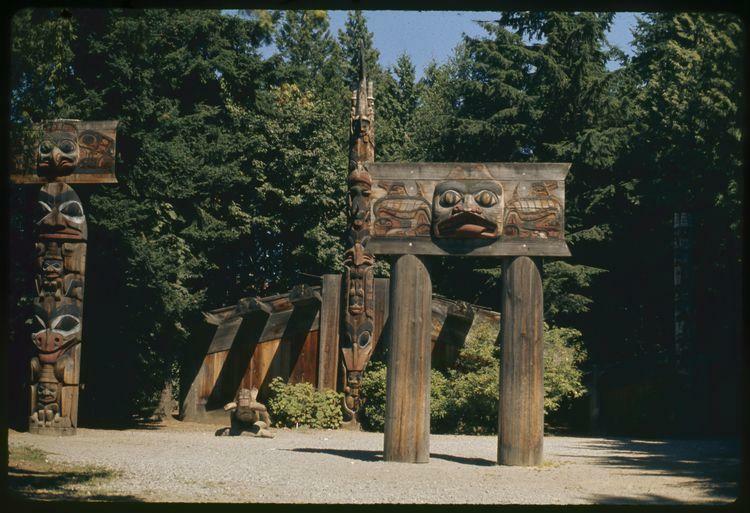 A50030 carved by Bill Reid and Doug Cranmer (1961-62) as the frontal pole for the front of the Haida house, at the University of British Columbia, for display in Totem Park. Moved to the new Museum of Anthropology grounds in 1978. Pole was removed from the Haida House in 2000-09 and placed in a greenhouse tent for conservation treatment and drying. Pole was then re-raised in the Great Hall of the Museum on Oct. 31, 2002.